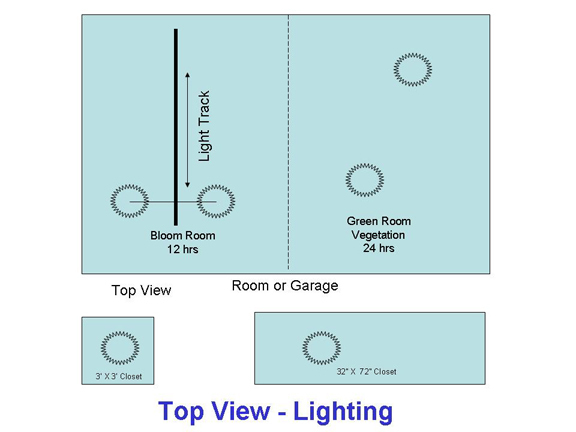 For lighting I use 2 1000 watt lights on a straight line track mover in my Bloom Room, and 2 1000 watt fixed lights in my green room. My rooms are 10 by 13 and the amount of light you will need depends on the amount of space and crop size. Refer to the light requirements of 50 watts per square foot. 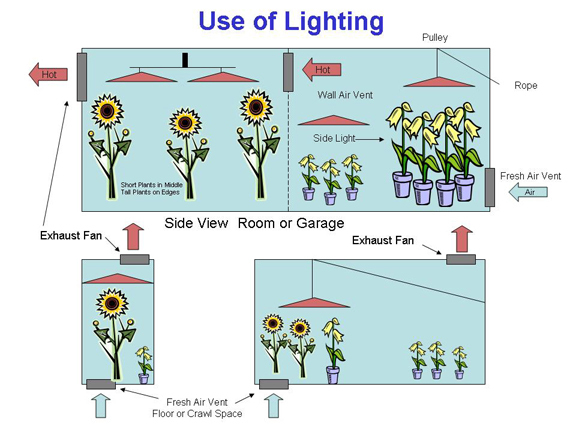 The use of fixed lighting in the green room allows for side lighting with a short hood over the shorter plants, a large hood over the large plants. The taller plants are staged so that they get side light from the light over the smaller plants. These lights are hung on ropes from small pulleys and tied off at the side wall. This allows us to raise and lower the lights for maintenance and growth. This way we do not have to use risers to adjust our plants, they can sit on the floor.